Line cookie sheets with waxed paper. In large microwavable bowl, microwave chocolate chips and peanut butter uncovered on High 1 minute, stirring after 30 seconds. Microwave 30 seconds to 1 minute longer, stirring every 15 seconds, until melted and smooth. Stir in cereal until well coated. Drop mixture by rounded teaspoonfuls onto waxed paper. Refrigerate until chocolate is firm. Milk Chocolate or White Chocolate Haystacks: Omit the peanut butter and substitute 1 bag (11.5 oz) milk chocolate chips or 1 bag (12 oz) white vanilla baking chips for the semisweet chips. 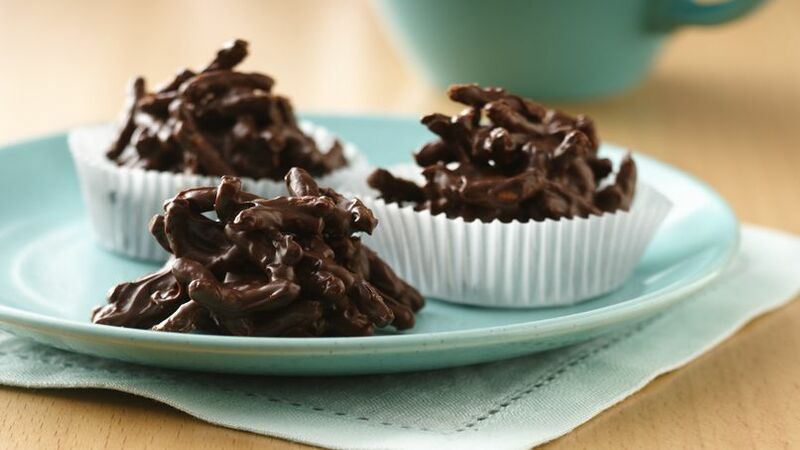 Stir up a batch of these easy no-bake treats with Fiber One® bran cereal.